I've been trying to make handles for a couple of household knives and found it both a lot of fun and very frustrating. Since I'm completely new to this it's obvious I will make mistakes. Nonetheless I feel I have to get it right this time since I have now a professional looking knive, imported from the USA, with a 1/8th inch thick blade, not like the flimsy kitchen knives I used before. Here's a picture of what I have sofar. 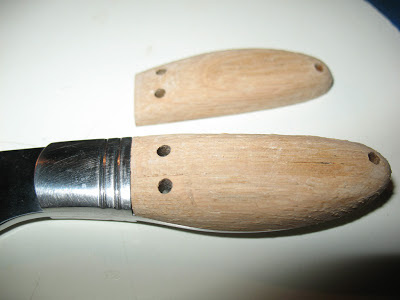 The idea is to glue the handle in place with epoxy and hammer 3 wooden pieces of round wood through the holes at the same time, that should keep it all together. Then file down the sticks flush to the handle. There's a lot of stuff to keep in mind; don't spill any glue, don't hammer the wooden sticks to pieces and make sure it all lines up. And also, try sanding stainless steel when you make a scratch, its a pain. If anyone has any hints let me know.